Sicrys™ I30EG-1, a conductive ink based on single-crystal silver nanoparticles in ethylene glycol (EG), is suitable for various digital printing technologies such as Inkjet and Aerosol systems. With long shelf life and storage at ambient conditions, the ink offers reliable jetting and good printability. Printed and sintered patterns provide good adhesion to a wide range of substrates. 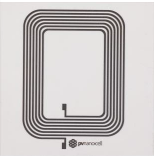 Applications include, but are not limited to, FPD, RFID and PCB.